A bed isn't the only place to display a gorgeous quilt whether it's one you've recently finished or a priceless family heirloom. With the addition of a quilt hanging sleeve to accommodate a dowel or rod, you can hang your work of art on the wall as well. Making a hanging sleeve is easy, and it's a great way to properly support your quilt as you show it off. Compared to the many hours of work that go into making a quilt, sewing a hanging sleeve is a breeze. Expect to spend about three or four hours making the sleeve by machine and hand sewing it to the quilt. The amount of fabric you'll need will depend on the size of your quilt. If you have fabric left over from its construction, this is a great way to use it. You won't see the sleeve on the front side of the quilt, but it's always nice to have it match. Measure the top edge of the quilt and add two inches to this measurement. This will be the length of the piece you cut for the sleeve. Measure the circumference of the hanging rod or dowel. Add three inches to this measurement to accommodate seams and a bit of extra room in the sleeve. This will be the width of the piece you cut for the sleeve. Cut a rectangle of fabric according to the dimensions you calculated in step one. Hem the short sides of the rectangle by folding over 1 and 1/4 inches on each end. You can create a rolled hem by tucking the raw edges under. Sew 1/4 inch from the rolled edge. Fold the rectangle in half lengthwise, right sides together. Pin to secure and then sew a seam 1/4 inch from the edge. You now have an inside-out tube. Rotate the seam so that it is facing up, centered on the top of the tube. Press the seam open. Turn the tube right side out and press again. Lay the quilt out on your work surface with the back facing up. Use a quilting ruler and a disappearing marker to make a long, straight line on the back of the quilt, one inch below the binding. Lay the tube, seam side down, on top of the quilt. Align the upper edge of the tube with the line you just drew. Pin the tube in place. Slip stitch the top edge of the tube to the quilt. Be sure to send your needle through the backing fabric and the batting without going through the quilt top. Keep your stitches small for strength. Once the top edge is secured, insert the actual hanging rod or dowel while the quilt is flat on your work surface. Pin the tube down and remove the rod. This will ensure that the excess fabric to accommodate the rod is in the back of the tube and that the quilt will hang flat. Sew the bottom edge of the hanging tube in place using a slip stitch. Insert the rod again and hang the quilt as desired. If you're in the process of finishing a quilt and want to create a permanent hanging sleeve as part of the process, this is an easy addition. The process is slightly different than that for adding the sleeve to a finished quilt, although the materials are the same. Before beginning, ensure that you have a finished quilt that is ready for binding. 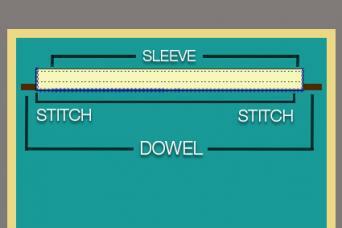 Follow steps 1 through 3 above for cutting the fabric rectangle and hemming the ends. Fold the rectangle in half lengthwise with the wrong sides of the fabric together. Lay your quilt on your work surface, top down. Align the raw edge of the hanging sleeve with the top edge of the quilt. Pin in place. Baste the hanging sleeve to the quilt, sewing a scant 1/4 inch from the edge. Bind the quilt as usual. Follow step 8 above to attach the bottom edge of the hanging sleeve to the back of the quilt. Adding a hanging sleeve gives you options for displaying your quilt. You can turn your finished work into wall art or a room divider with ease, allowing you to show off your beautiful project throughout your home. What's more, a sleeve doesn't reduce the functionality of your quilt; when you're ready to use it as a bed covering, simply remove the hanging rod.